You may know him by his #1 bestseller The Blood Sugar Solution that’s been featured on national shows like Live! With Kelly, Dr. Oz, Charlie Rose, and others. According to Dr. Hyman, you can literally transform your health with the food you put on your plate. But best of all, you can enjoy this journey to renewed vitality and optimal weight with one delectable meal after another! Get more information about this all-new cookbook here … as well as THREE Bonus Gifts you’ll receive when you order it. Whether you follow The Blood Sugar Solution plan or simply want to eat your way to a healthy weight, Dr. Hyman wants you to know that you’re not limited to a steady diet of bland and boring “health foods” that taste like cardboard going down. In fact, there’s a world of culinary delights waiting for you when you replace the mass-produced “factory foods” that make us fat and sick with home cooking at its best. These recipes show you the way. …to fill your kitchen with the enticing aroma of these world-class dishes. You’ll be surprised by how easy it is to prepare the healthiest and best-tasting food you’ve ever had. What’s more, many dishes take less than 30 minutes to prepare, so you’ll never run out of delicious breakfast, lunch, or dinner options no matter how busy your schedule! Sound Tempting? Then What Are You Waiting For? Click here for more details about The Blood Sugar Solution Cookbook and the three FREE Bonus Gifts you’ll receive with this special one-time offer. 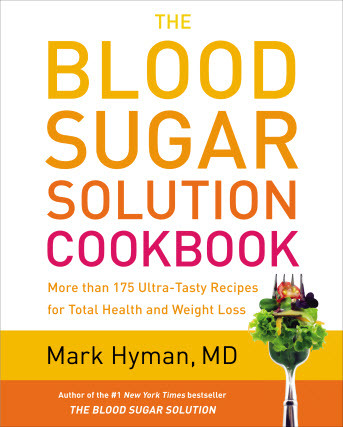 One of the Bonus Gifts is Admission to a special Blood Sugar Solution webinar that Dr. Hyman will be hosting on March 27th, 2013. In this online event, you’ll see how easy it is to prepare healthy, delicious meals, all based on his Blood Sugar Solution secret to health and vitality. Believe me, you won’t want to miss this inspiring and motivating event. But you must act now—this online event is open to the first 500 buyers only! Go here and Dr. Hyman will fill you in on everything! P.S. Follow this link and you’ll also find the recipes for two of Dr. Hyman’s favorites: Spiced Ground Turkey Wrap With Watercress and Avocado and Mexican Lasagna. Give them a try and let him know what you think! P.P.S. Remember, the clock is ticking. You must respond soon if you want your invitation to Dr. Hyman’s March 27th Blood Sugar Solution Webinar, a $50 value in itself. Act now! That's awesome! Congrats Diane. I really need to look into that book! Very belated but that is so cool, Diane! Dr. Mark Hyman has helped tons of folks. I'm sure this new book will help even more, so how wonderful to be a part of it! Thank you Shirley. It was really cool to be included. There are tons of great recipes in there and it's nice they are all gluten free.